​How many times have you been on the Lake in the dead heat of the summer and witnessed fish breaking the surface early in the morning? While you have bait on down-lines, you realize that you failed to bring a casting rod/reel with an artificial. That, my friend, is a bad mistake on your part. I think the least amount of equipment that you should always have is down rods, a rod/reel for casting artificial lures that will catch a Striper, and at least one Umbrella Rig fitted to a suitable trolling rod. There are some other things to take with you. For instance, always have extra bait saver and salt for your bait tank just in case the water in the tank goes bad (or your Grandson pours a Coke in the tank). LOL! To sum all of this up, I think you should always keep all of your fishing gear on board every time you go fishing. You never know what the season holds for any given day. Examples of this include: various hook sizes, base line for your reel, fluorocarbon, In-line Planer Boards and most important – a great lunch such as a chicken salad sandwich! Summertime fishing has different requirements. It’s a good idea to bring one or more extra bags of ice to maintain a safe water temperature for the bait tank. To summarize, remember to bring the things I have mentioned above. 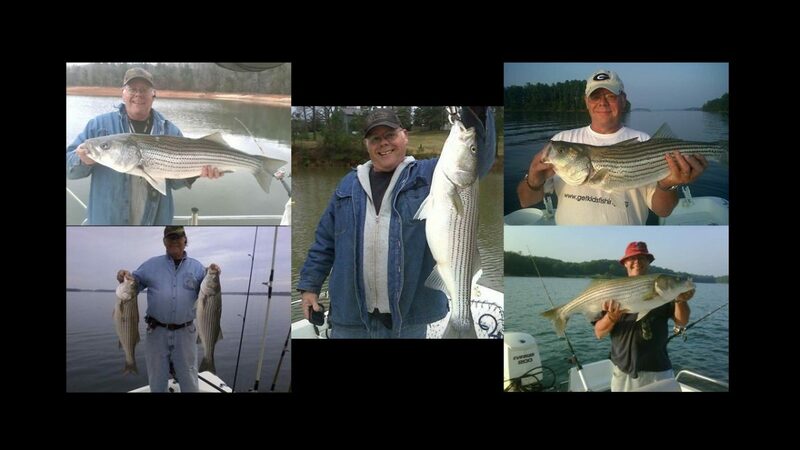 You have to be flexible with the fishing methods applicable for the various seasons in which you fish for Lake Lanier Stripers. If you take my advice, you won’t have a bad outcome and you won’t get angry at yourself. I hope this will help you catch your dream fish! DON BROWN – STRIPER FISHING TOURNAMENT Create a free website or blog at WordPress.com.